I’ve been promising Mr W something handmade for years. 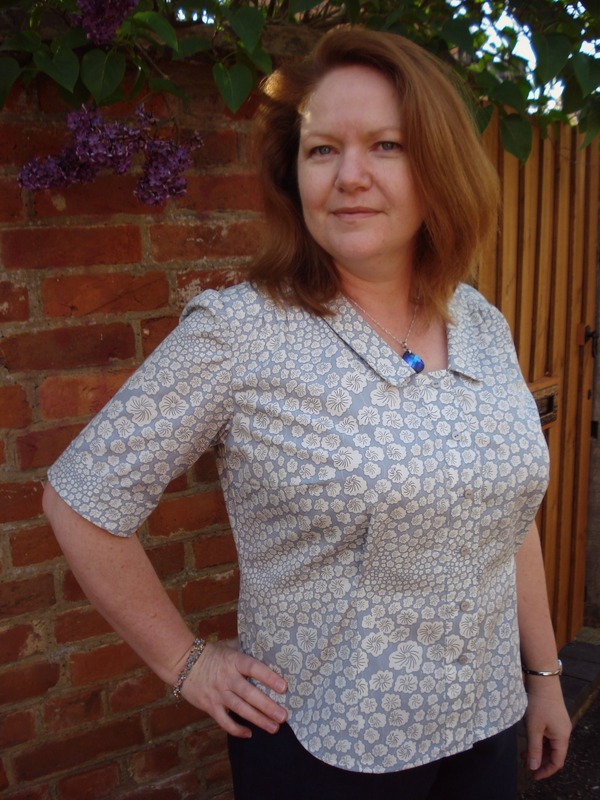 It’s usually met with a look of doubt, those shifty eyes that say “yeah, right!” The first thing I thought I’d make was some shirts, found lovely ex-Paul Smith fabric at some of the sewing shows. Then he got fussy – “make sure the stripes follow exactly, make sure they join at the cuffs and collar, make sure it doesn’t look homemade…. Well, that last one did it!! HOMEMADE!?!?!?! Needless to say, that lovely Paul Smith shirting found its way to making shirts and blouses for myself and the girls instead and he got nothing! But for a while now I’ve wanted to make him a nice coat, something smart but comfy. He’s massively allergic to spending money on himself, so wouldn’t ever think of dropping £100 or more on a single item of clothing that only gets worn in one season a year. I originally thought I’d make a peacoat, but after trying out the Thread Theory Goldstream, we realised the shape didn’t suit him. So I resorted to drafting one. 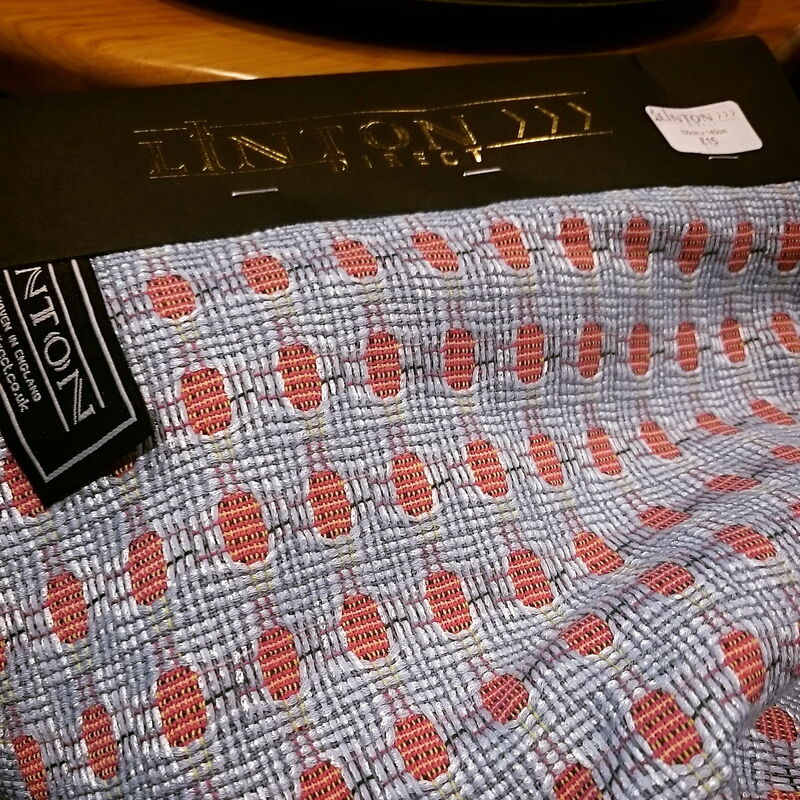 I have a couple of menswear drafting books, but the only one that had a good enough looking block and resulting patterns was this one, Patternmaking for Menswear – Classic to Contemporary by Injoo Kim and Myoungok Kim. I bought it about 2-3 years ago from Foyles at their Charing Cross Store. (amazon link) We’d had a day in London, finishing at the book store while we waited for our train home and ended up with quite a pile of lovely books! Anyway, I’ve looked through it loads of times, but never found the time (or inclination) to use it, until now! 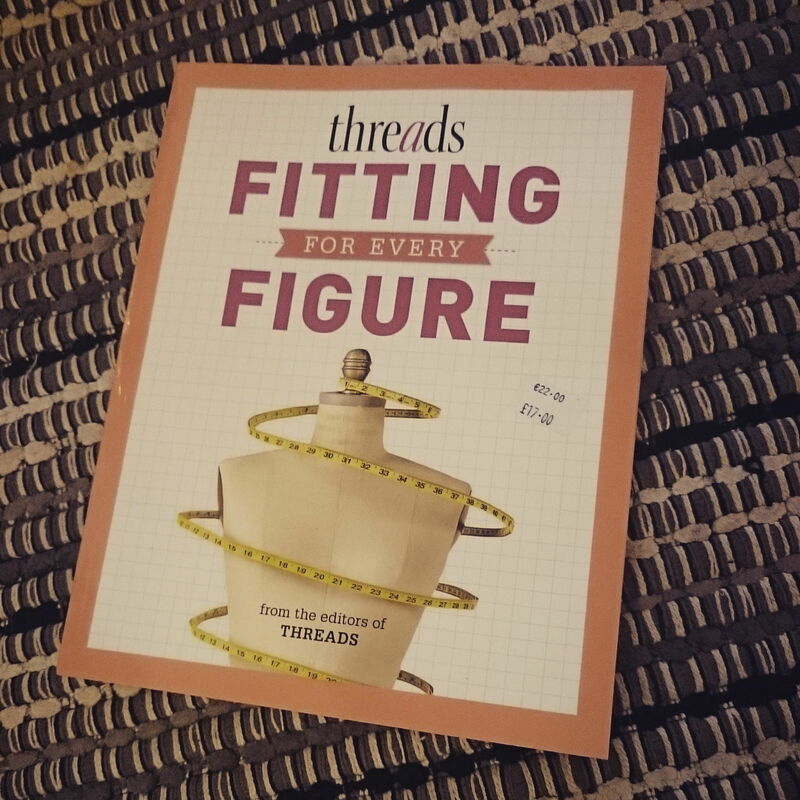 Having made exclusively for females, this book helped to make sure I was measuring all the right places with good photos of where to measure for a man. The only thing I had a problem with – and it was a major problem, was the unit of measure. As it’s a US book, it’s all in inches!! I tried to work that way, but got myself completely muddled. My ruler might have inches on it, but trying to find 6.3225 inches on my ruler just wasn’t happening!!! So I threw out that draft, which looked so wrong it wasn’t funny, and converted everything to metric. I have a chart in my notebook now with all the little bits of inches converted into nice and tidy millimetres. So, depending on what works easier for you, you might like to convert everything before you start, or maybe you know where to find 6.335 inches on a ruler that shows only 1/8. The draft, once the measurements were converted, looked much better! 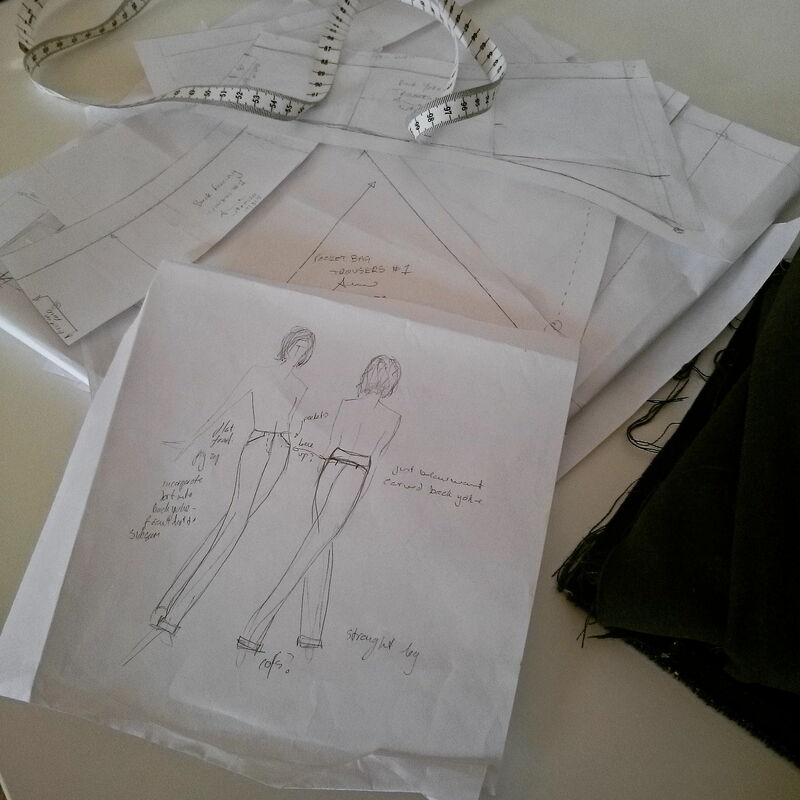 You start with a torso block – I chose the slim fit as we wanted a more fitted garment. Then that block is converted to a slim fit coat block. You do the same if you’re wanting a jacket, start with the torso block and convert to a jacket block. The sleeve blocks are drawn for the correct block. The original block had a pretty good fit, the sleeves were too long (not sure how I measured that much!) and they needed a bit more room in the bicep area, but otherwise all was good! The only thing that threw me a little was when you’re told to extend or move a line out 1/4 to 1/2 an inch, or 1/2 to 3/4. Doesn’t sound like much, but converted to millimetres that’s 3-6mm or 12-19! That’s a lot of mms! So I opted for safety and chose the middle. 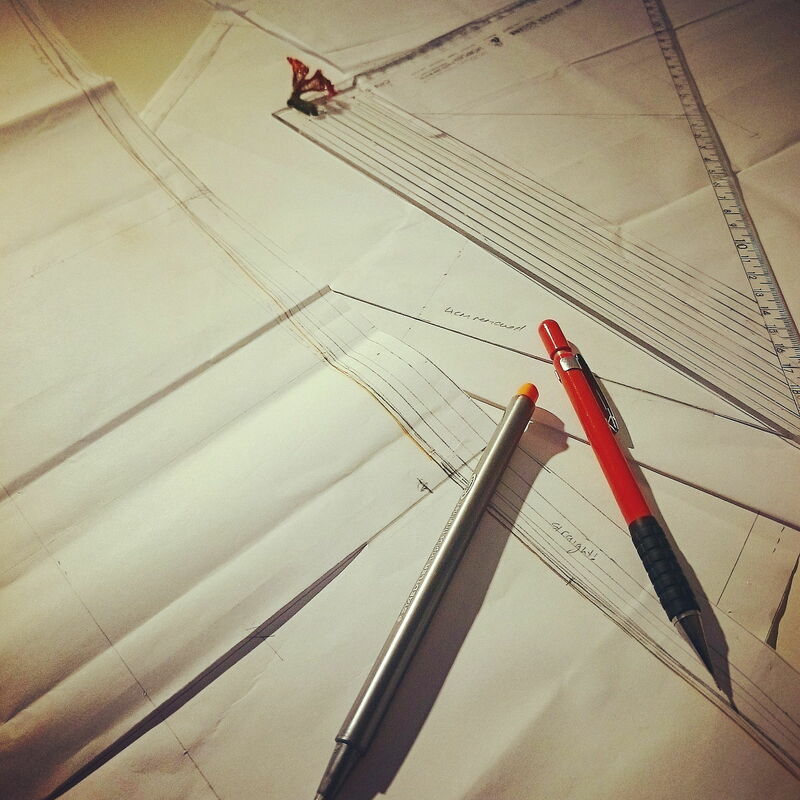 Drafting the style lines and making the working pattern was next. We chose the Chesterfield style as the base for this coat, drafting the main body of the coat was straightforward and the instructions pretty clear. When you get to the lapels, collar and facings though, you start jumping around the book. The collar and lapels are in the jacket section of the book, facings in the shirt section and pockets are back in the coats! I have a fair few bits of paper sticking out the top of the book to keep my places! Moved the back vent up so it works properly with the new length. Shortened the sleeve by 3cm, 1.5 above the elbow line and 1.5 below. Lifted the break point by 3cm. Redrafted the lapels 7.5mm wider and the collar 1cm deeper in the fall. 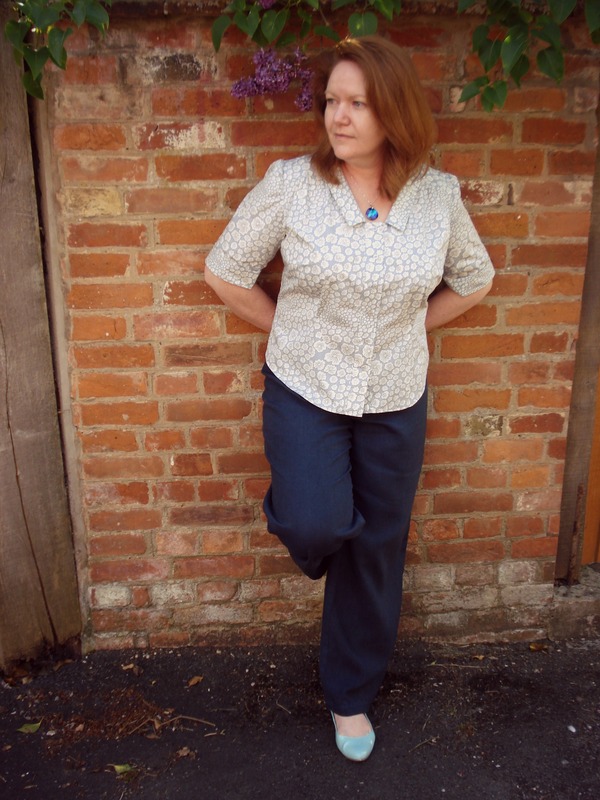 I made these adjustments to the pattern on Saturday and toiled again, adding the pockets, yesterday. I was lucky enough that Mr W came home before I went to bed and so I was able to get him to try it on again and check. It all works! I got the thumbs up!! The fit is great, he thinks it may be too long still, but any shorter and it’ll be a jacket…. A coat needs to at least keep your bum warm!! My next task is to draft the facings and lining pieces. He wants two internal pockets and I know they’ll need to be reinforced, judging by what he does to his jacket pockets. I want to find him a jazzy, different sort of lining and he’s asked for extra trims on the inside. So I might dig out my silk box and make reams of bias strips to sandwich into the seam between the facings and lining. That’s only part of my coat making adventure that was supposed to take place in September. If you follow on Instagram, you’ll have see I’ve already finished one coat, and as soon as the person for whom it was made comes to put it on, I’ll to show it all off! There’s another in progress, only at toile stage at the moment, but hopefully I’ll be able to move it forward this weekend after a fitting. That’s everyone else’s coats, I haven’t even started on mine! Anyone else making coats this month?? So, I decided at the end of August that I needed to get making some coats before the weather turned. Before it was cold enough to need one and it still wasn’t in a corporeal form… This is in addition to still having numerous items yet unmade from Daughter No2’s summer list and thinking I might give the Refashioners 2017 challenge a go. While I’m listing reasons why September is not a good month in which to try to make 3 or 4 coats, I should add that we had a week away in the beginning and still had Daughter No2 home until the middle of the month before she was back to uni. But I had decided… So what coats am I making? I have the Eagle Jacket/Coat from Vanessa Pouzet for Daughter No2, the Goldstream Peacoat for Mr Not Compulsive and I wanted a new coat for myself, exactly which one was only decided after I saw @_ym.sews_ Waffle Patterns Tosti in the most amazing yellow dry oilskin. I sort of wanted an Eagle jacket for myself too, but after toiling it realised it wasn’t the shape for me. So, I took patterns with me on holiday and traced them out on the dining table in the holiday apartment in the evenings, helped by a glass or two of wine. I toiled the Eagle jackets upon our return and Daughter No2 likes hers, the only alteration is to lengthen the sleeve by 2cm. Mine, as already said will be recut as a different toile! Now that I have the go-ahead for the Eagle, I hit a stumbling block. She doesn’t like the fabric from the stash that I picked out. Press pause on that project then. After toiling the Goldstream Peacoat for the other half, that project was nixed. He didn’t like the shape, it was too bulky, didn’t like the large collar or wide lapels either, then decided he didn’t actually fancy a double breasted coat…. So nothing about the Goldstream Peacoat then. Back to square one, I decided to draft a coat block and put all the “right” ingredients together to form the “perfect” coat. So in the meantime, it’s now the end of October and still no coats to be seen, but there are a few toiles. None for me, I haven’t got that far! But daughter No1 has chosen an pattern and fabric from the stash that I’ve toiled, fitted and adjusted, so that can get going. Daughter No2 has also chosen a pattern and other fabric from the stash for two new coats, still to be traced, toiled and fitted. The other half has a block that is undergoing a very slow transformation. It seams the perfect coat will take a while to be realised. Say tuned for more of what I’ve been doing while the coat projects hit their respective brick walls. My sewing machine has been working overtime during the last week and a bit, quickly trying to make the last few things for Daughter No 1. The departure for her planned travel to Asia, Australia & America has finally come. 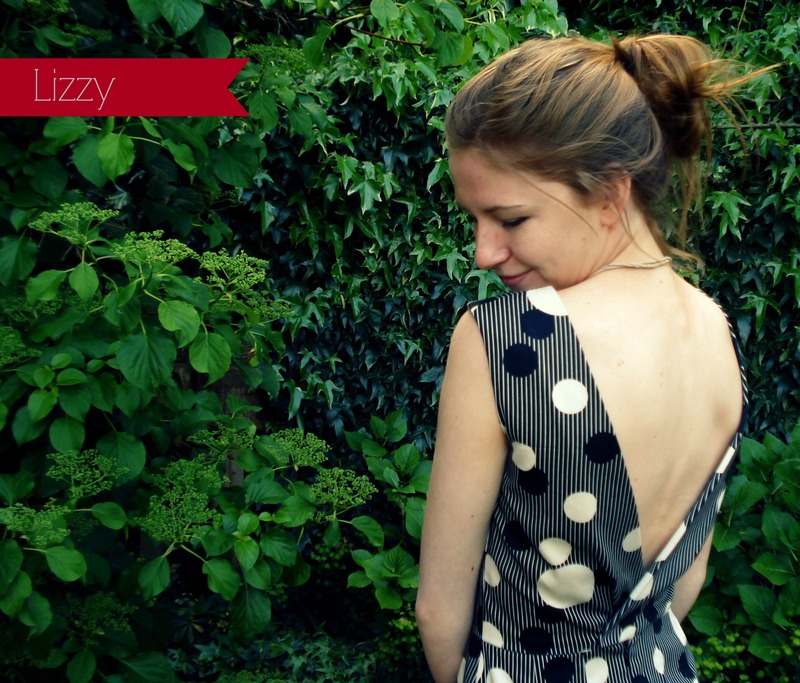 Amongst the things I made for her (which I will cover in another post) was this dress. She wanted something that would just hang, not cling, and be cool to wear in the tropical humidity of Thailand, something suitable for cocktails on the beach in Fiji & totally wearable when exploring Rodeo Drive. It needed to have fullness, but not be a tent. She didn’t want extra fullness in the front, hanging from the bust. She drew me a sketch of what she had in mind, then left me to it. I started with her close fitting bodice block, drawing a one piece dress block and then converting it to the lingerie block. This involves reducing ease and doubling the size of the bust dart. For the dress pattern the bust dart was moved to the underarm position. I added a section to the side, from the waist to make the fullness. The double darts in front and back were eliminated, but the back dart was effectively transferred into the centre back, making the back shaped and fitted. I also needed a swayback adjustment of about 2cm. I intended to use an invisible zip in the centre back, French seams throughout and self bias for the top edges and straps. The toile in cotton. The swayback adjustment hadn’t been done. The toile revealed that I needed a swayback adjustment, and that I needed to alter the fit of the top. Daughter No1 wanted it a little looser. I was concerned about the hang of the handkerchief section, but hoped that in the silk that we’d chosen that it would look a lot better. Dress in progress, silk definitely drapes better than cotton! And the swayback adjustment worked a treat. The silk was given to me by a friend, it’s got the most beautiful sheen and drape, but for me, it was just a little too bold. However, Daughter No1 loved it! The bands are a red and white hatched pattern, while the blue is actually purple and black. I only had two metres and it was pretty narrow but we had just enough to squeeze the dress out. I was worried that there wouldn’t be enough for the bias strips. Thankfully that wasn’t the case in the end, I didn’t really need that much bias. But please remind me that working with narrow bias in silk really isn’t easy, and tries the patience of anyone, especially when you’re up against the clock. 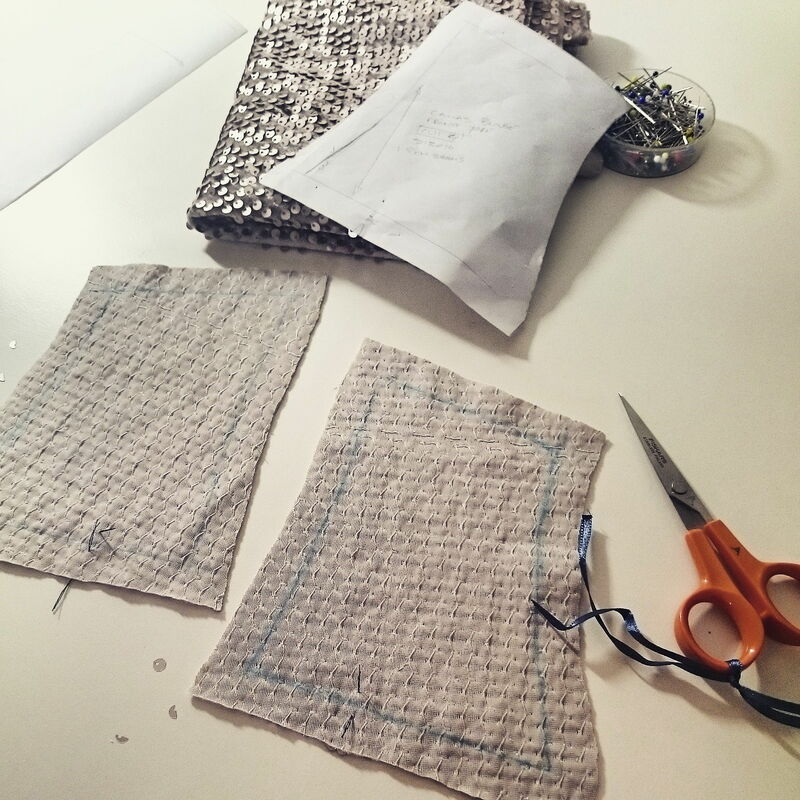 Putting an invisible zip into a french seam, reinforcing the area with fine interfacing. I made the pattern on Saturday night, toiled it midday Sunday, made the adjustments and got cracking immediately. It had to be finished by 11am on Monday morning!! Needless to say I was still handstitching bias at 11am so we left a little late for the airport, but all was good, she loved the dress and stuffed it into the rucksack straight away! I am hoping to see photos of it in far of exotic places on Instagram soon! Here it is on Betty, my vintage mannequin. I love the drape at the sides, and the slight drop of the handkerchief hem. I really do hope it sees lots of wear in the next 6 months! This year is going to be a different one for sewing. If you haven’t already noticed, things are going much slower. By this time last year I’d completed 22 projects, this year I’ve done 13 and am working on my 14th. It’s not as if I have less to make, or less fabric to play with. Just less time. I have stuff I need to photograph, neither Camas Blouse have made it to the pages of the blog yet, despite them being completed late January, early February! Here’s a glimpse. 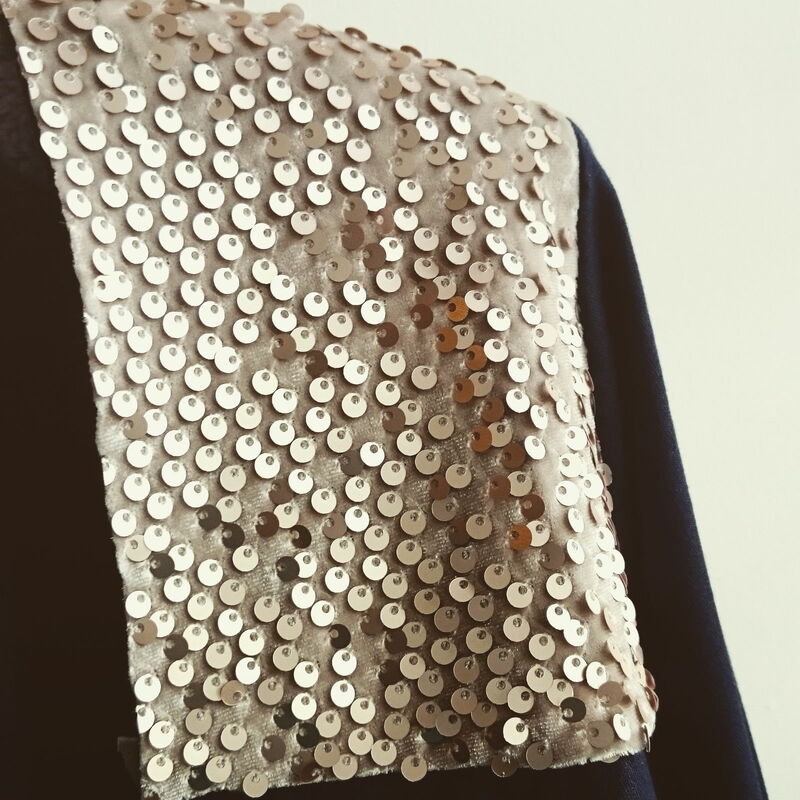 Marking the seamlines on the reverse of the sequined shoulder yokes. I decided this year to get my act into gear regarding trousers too, the styles in the Burda magazines aren’t floating my boat and there really is a limit as to how many times you can remake a pattern, no matter how you think they look so different in different fabrics. 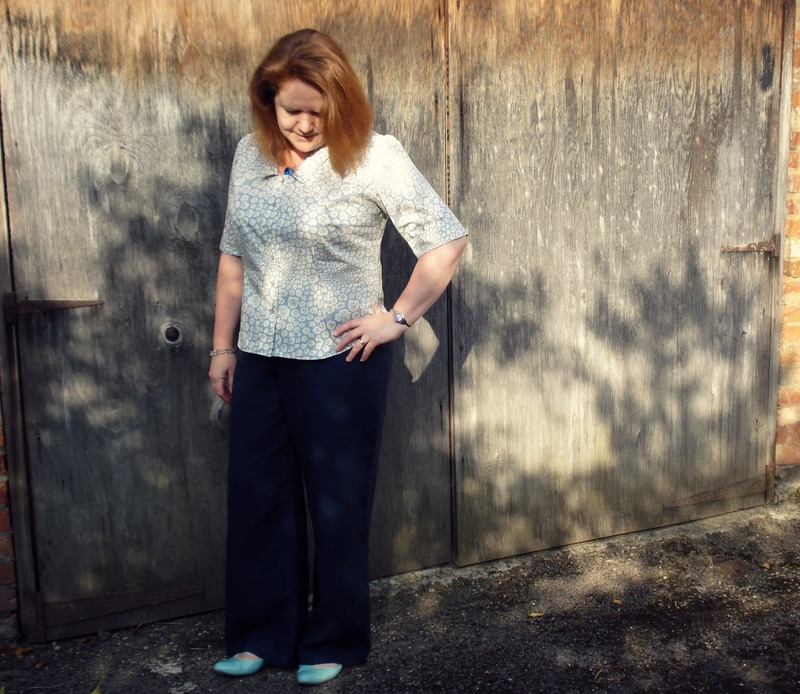 So I’ve managed to get a new pair of self drafted trousers up and running too. I stole a couple of different styling ideas from different patterns I like, like pocket shapes and cuffs. I’m pretty happy with the first pair, I think the proof will be in the wearing though, so I’m holding off rushing to make a new pair before I’ve worn these a couple of times to identify areas of improvement. Sketch of the intended pattern and a pile of taped together bits of paper forming the pattern pieces! Adjusting the style lines after the first toile. 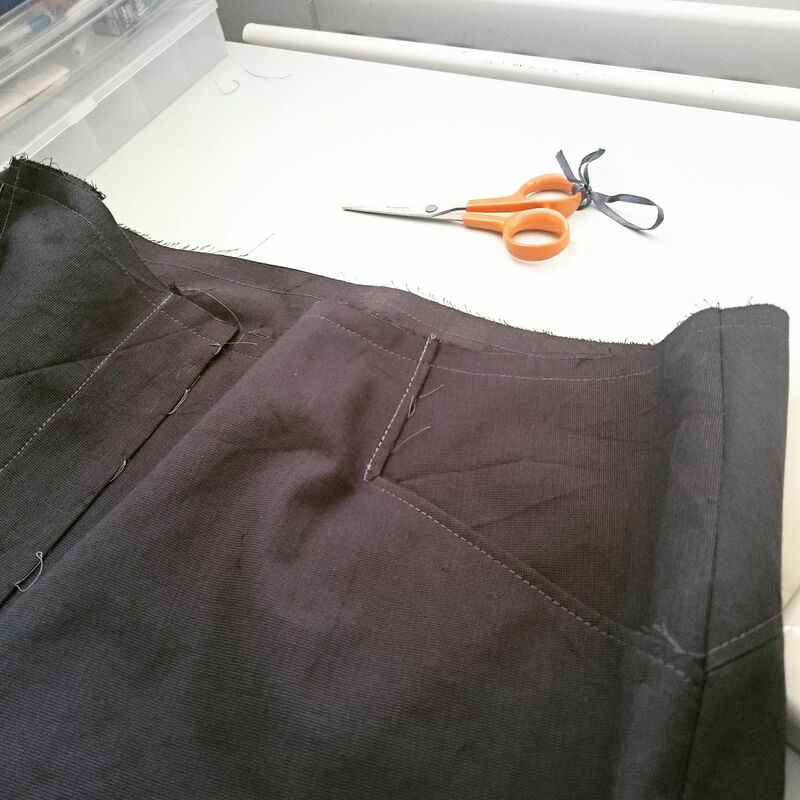 Almost there, fly zip, topstitched square shaped pockets. My current project is a simple v-neck tee from a self drafted block. I’d needed to adjust the original block heavily, apparently Winnie Aldrich doesn’t really mean 0 ease when she says it for a tee block!! I think it’s sorted enough, so I’ve marked the fashion cut and created the style pattern I’m after. I need to toile it today, so fingers crossed. The one thing about making garments with jersey is that each and every jersey behaves differently. I’ve even had different results from the same bamboo jersey in different colours!! Does the dying process have an effect?? Who knows. This time I’m using a pale grey viscose jersey I bought from Croft Mill Fabrics last year, it’s not one of those flowing jerseys, so hopefully it works well with the simple shape. 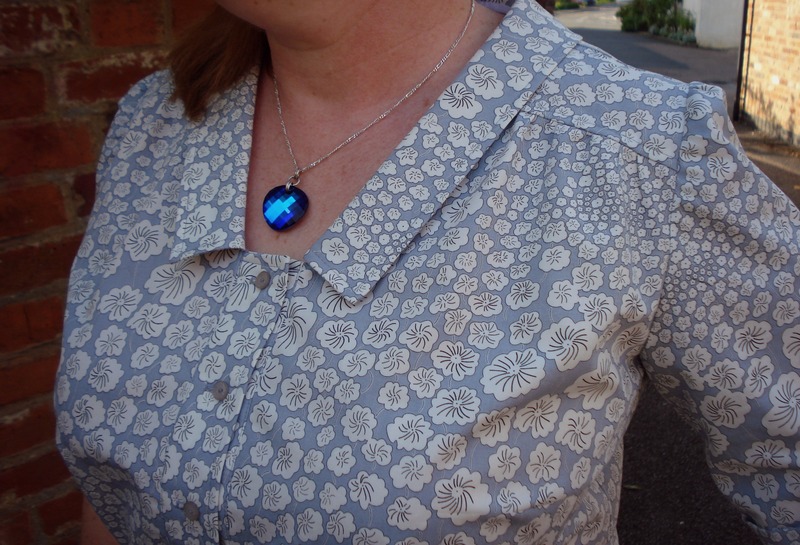 I decided to lift it from being a boring grey tee I’d dig out a tube of silvery beads and embellish a bit. We’ll see if my hands behave enough for me to hold a beading needle long enough to get any beads attached! Speaking of hands, I’ve been rushing to crochet enough granny squares to make a throw for daughter no2 before I have to stop. Holding a crochet hook is not easy at the moment, but I’ve managed fairly well so far. I crochet like mad when my hands behave and then have to leave if for days other times. I hope I get it all finished and put together before she heads off to University in September. I have a long way to go yet! This was the last photo I took of the growing pile. I have another 18 to add to this. 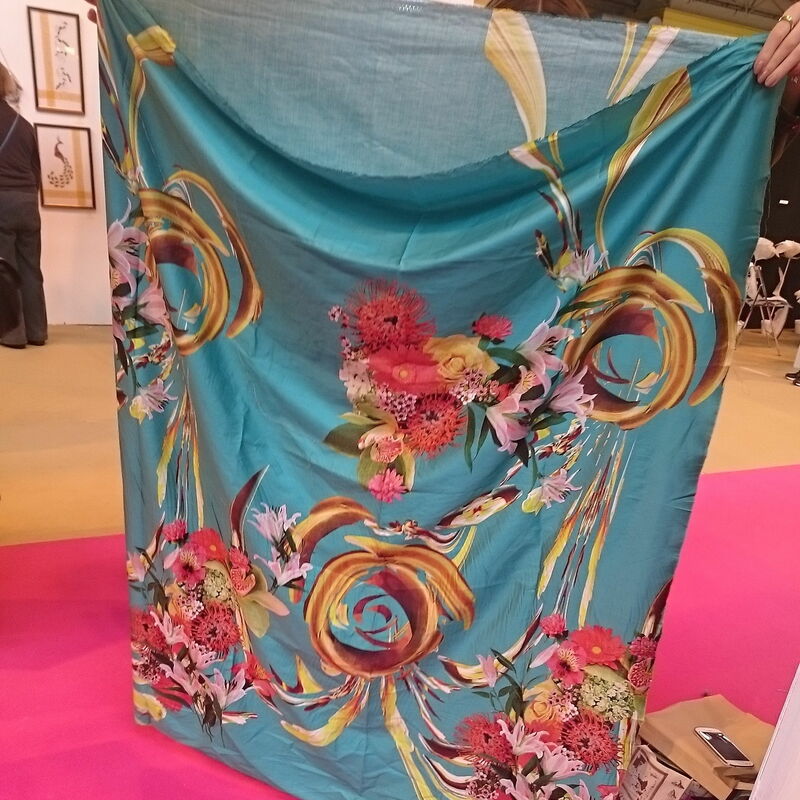 Silk print onto cotton, the most amazing colours! I got 2 lots of 2 metres, neither for me!! You can never have too many books to assist with fitting issues. Everyone has a different opinion! So that’s me for now. 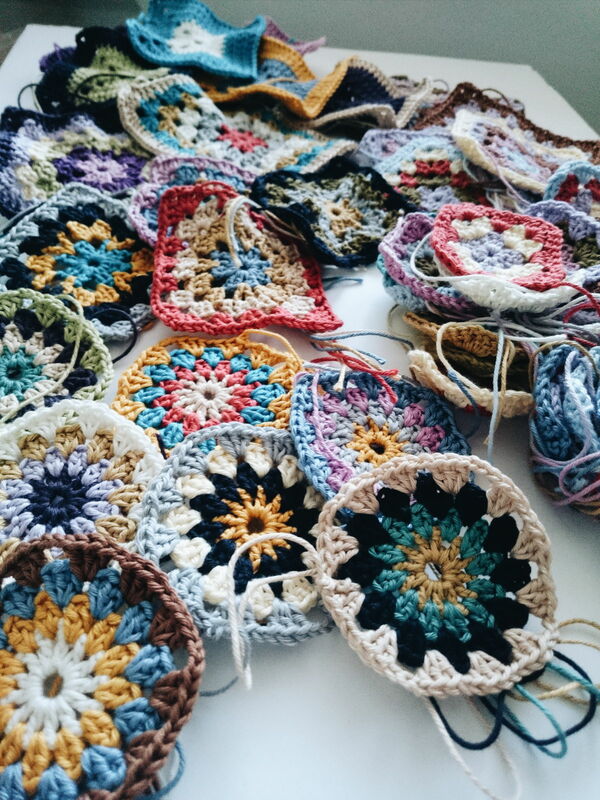 I have lots to sew and lots to crochet and lots to photograph! Daughter no1 will be home for the Easter Hols soon and I have lots of things I want to make for her before she goes back to University, so I’m going to have to hurry up just a little. 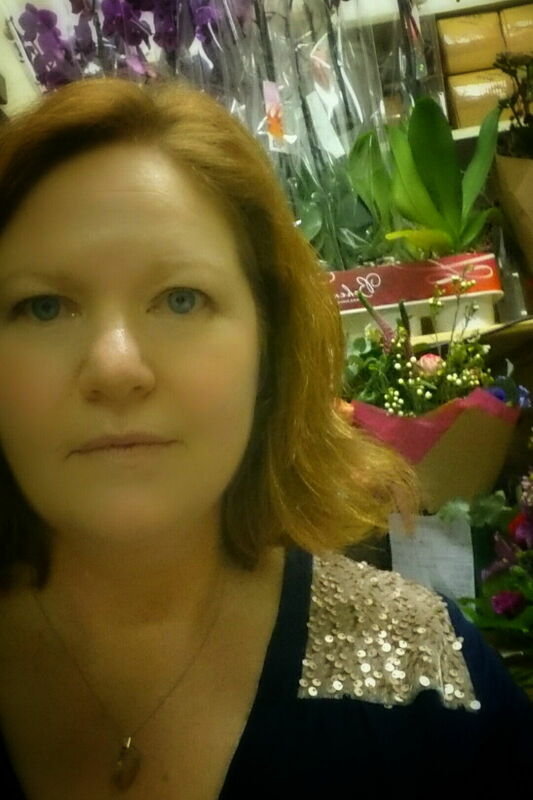 Author Anne WPosted on 19/05/2014 19/05/2014 Categories design, pattern cutting, StashbustingTags blouse, Liberty City Poplin, pattern cutting16 Comments on Look Ma, I’m Wearing a Print! 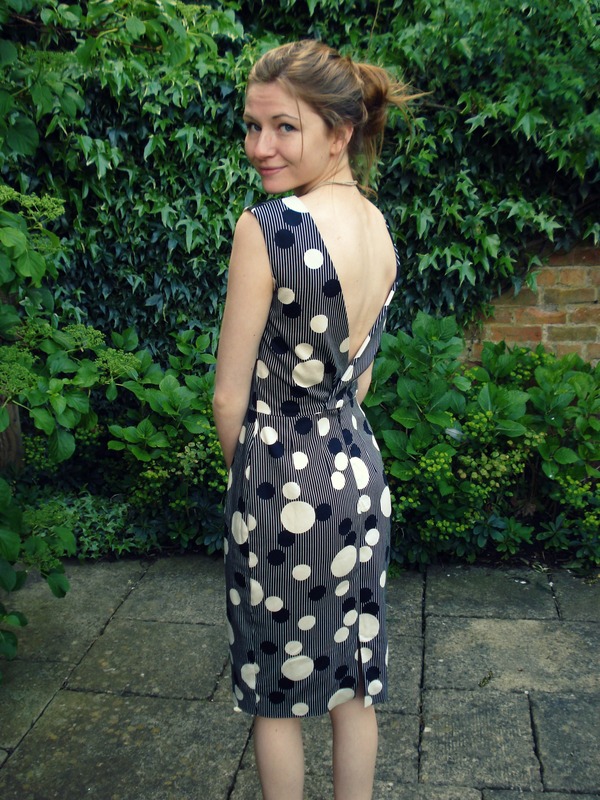 I have finally made a dress for Daughter No1! It isn’t the dress I’d sketched for the Miss Bossy Challenge, although that is underway. 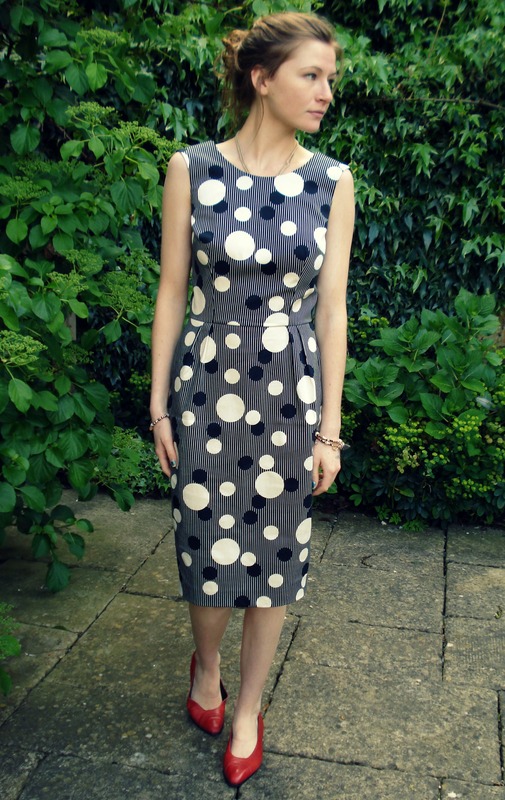 This was partly inspired by a vintage pattern I have and Daughter No1’s desire to have a “grown up going out” dress. 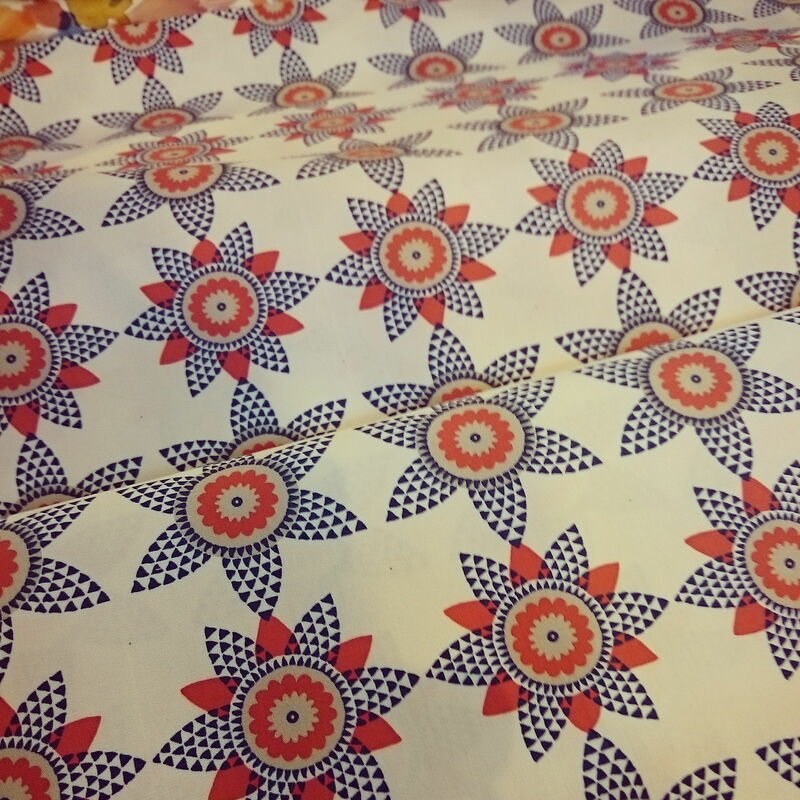 The fabric is a stretch cotton John Kaldor print I’ve had for a very long time, just waiting for the right pattern to come along. Normally skirt lengths for this young lady are most definitely above the knee, and being petite that’s the way she prefers them. However, no wiggle dress I know has hems that short, this one finishes just below her kneecap, dead on 60cm from her waist. I used the 2-piece dress block, making the finished length 60 cm and removing 1.5cm from the hip, tapering to 3cm at the hem. She was definite about the hem being narrow! The front skirt dart was converted into a pleat, and I added a second, but the added width does not extend to the hemline. The back skirt retains its 2 darts and centre back seam. 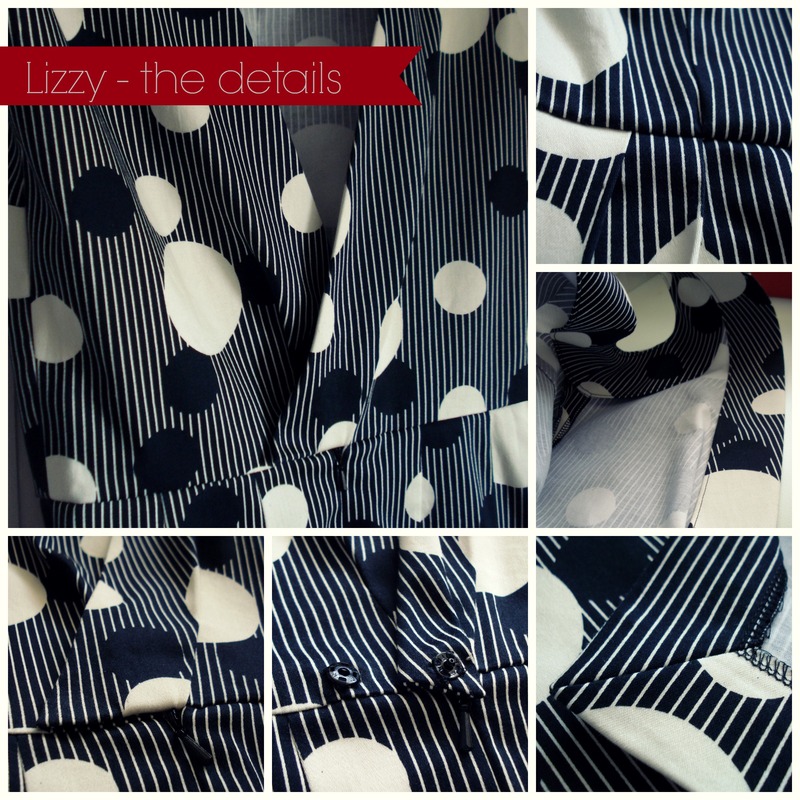 I tapered the centre back seam to lose 1.5cm at the hem, then I added a 15cm long vent. then she decided she didn’t want a proper vent, just a split. The front bodice has waist and underarm darts and a simple neckline, it’s in the back that the fireworks are happening! The back has a deep “V” that crosses over the centre back line about 15cm up and overlaps at the waistline by 5cm. 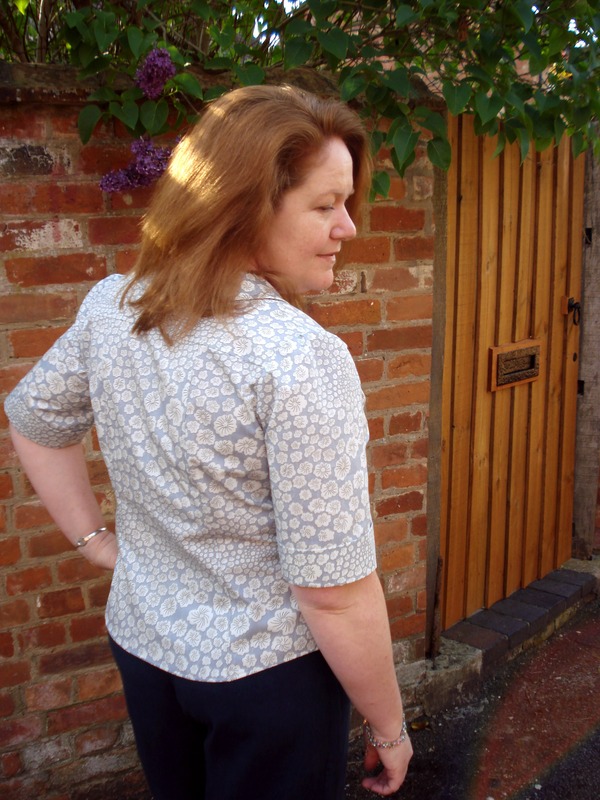 The back bodice dart was converted into a pleat and moved to the intersection of the centre back seam & the waist seam. Once I’d determined the line for the back I added a 5cm grown-on facing. There is a 25cm invisible zip in the skirt in the centre back, and the crossover bodice is fixed with a pair of press studs. The 1935 jacket for Daughter No2!! 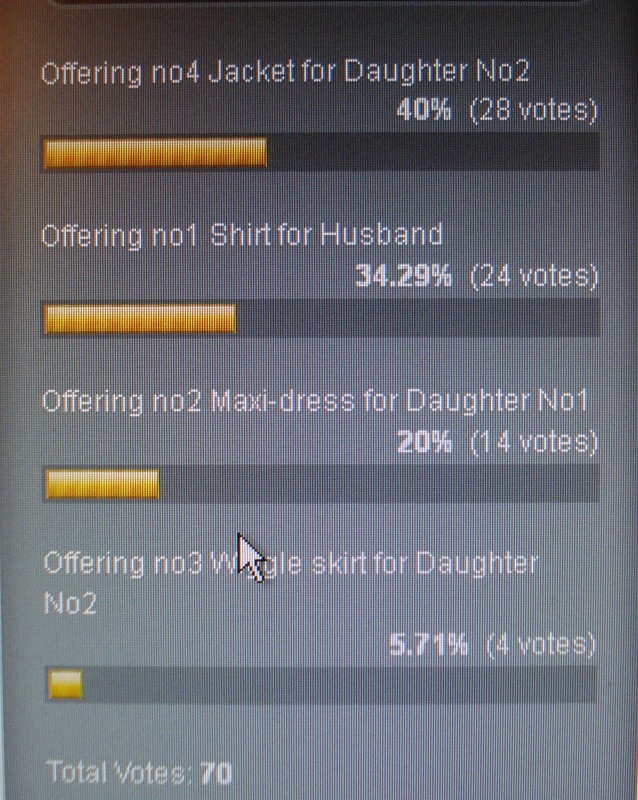 Husband’s shirt lost by a mere 4 votes! I guess that means I have some work to start getting on with! But – I will also be making the patterns, and garments, for the other offerings. 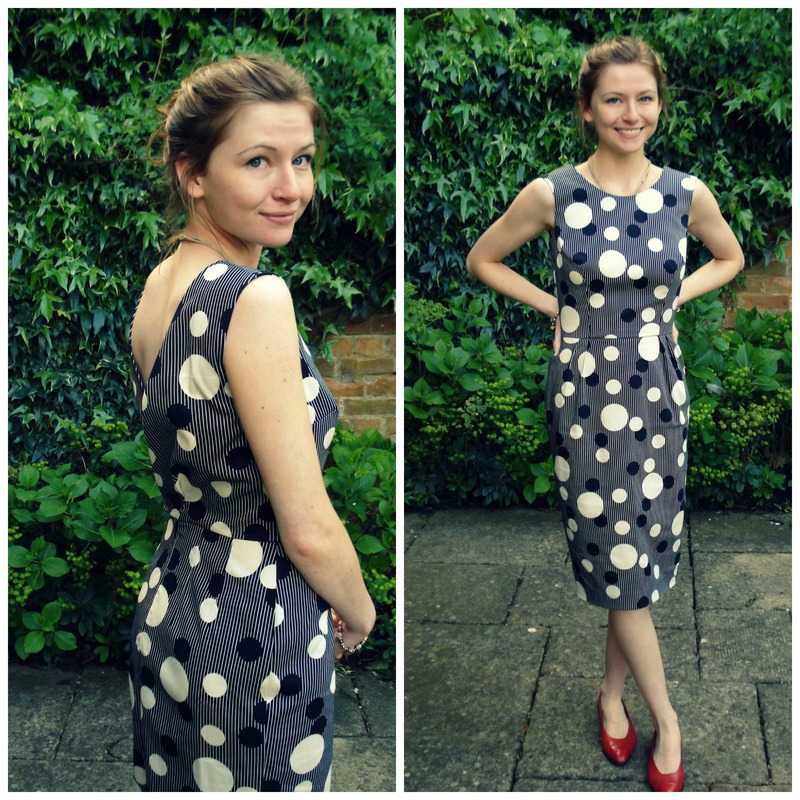 In order, I will make a shirt for Husband, then the maxi dress for Daughter No1 and the wiggle skirt for Daughter No2. They will all get done, in that order, but not necessarily all in March. It all depends on how long this all takes me! 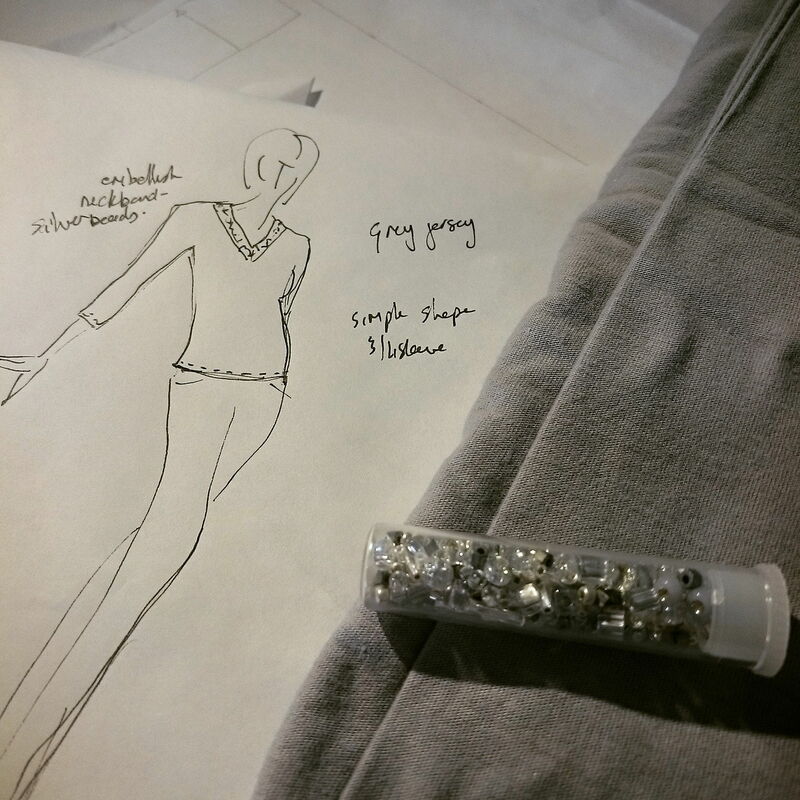 I am really looking forward to the results of all the other polls, and getting to see everyone’s finished garments. March is going to be good for sewing!